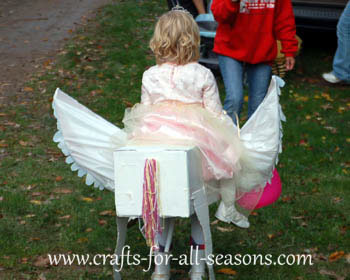 This princess on a Pegasus is a costume I made for my daughter. She was really into magical, fantasy type stuff at the time, with a winged horse being her favorite. I had seen costumes you could purchase with a cowboy or cowgirl on a horse. The child's legs were the front feet of the horse, and "fake" legs were created for the rider. I just decided to change it up a bit and make some wings for the horse. 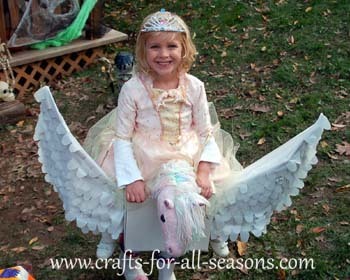 If my daughter dressed up in one of her princess costumes, then the princess on a Pegasus costume would be complete. I was also lucky because she just happened to have a play horse on a stick; the kind they ride, so I didn't have to make a horse head. I apologize for the lack and quality of the pictures. There are no step by step photos because I didn't know at the time that I would be posting this as a tutorial. 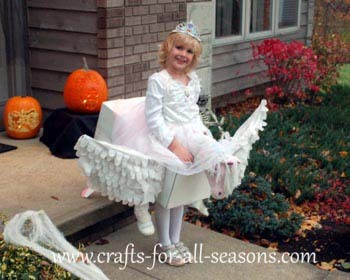 But I will explain as best I can how exactly I made this princess on a Pegasus costume. 1. First, cut a large circle in the top of the rectangular box, large enough to fit your child's body. 2. On the opposite side of the box on the bottom, cut two holes where the child's legs will fit through. 3. If you are using a horse head from a toy stick horse, make a hole on the top of the box, near the front end. If necessary, make another hole on the other side of the box, near the bottom, for the end of the stick to rest through. Thread the stick horse through these holes. 4. At this point, try the box on your child. Thread the stick horse through the holes. It should be supported on its own, but at the end you can secure it more with clear packing tape to keep it secure. Have the child get in the box, over the stick horse, by having her step through the large hole in the top and stepping through each of the holes for her legs at the bottom of the box. She should be straddling the stick horse. Make any adjustments to the hole sizes as necessary. 3. Remove the child and paint the box white. 4. Add a yarn tail of the back of the horse. To do this, I made a hole in the rear of the box. I gathered several lengths of yarn and threaded them through the hole. I then knotted the yarn from the inside of the box to secure it. 5. I created horse back legs by cutting out a leg shape from cardboard, painting them white, and securing them to the back of the horse body using white duct tape. 6. To create the wings, I cut two wing shapes from the cardboard. I folded each down the middle, just slightly, to make them bend a bit (so they didn't stick straight out). I spray painted them white, then attached them to the body using some heavy duty white duct tape. 7. Using a white plastic garbage bag, I cut out a bunch of little petal shapes, all in a row and attached to the same strip of plastic. I attached each strip to the wings with tape, then added another strip of petals right underneath them, overlapping slightly. This gave the soft look of feathers on the wings. 8. To create the fake legs of the princess, I took a pair of white tights and stuffed them with cotton. I put white dress shoes on the ends of them (securing them on with clear packing tape). These base of these legs were then duct taped on the top of the box from the center hole, so that they overhang the sides of the box. 9. To put the princess on a Pegasus costume all together, have the child dress up in a princess costume. From the waist down, have her wear white pants or tights and white boots. The boots will be the horses' front legs, so you can paint little hooves on them if you wish. Have her step in the costume and secure the box on her by creating two straps which go over her shoulders like a backpack. I made clear straps by applying two pieces of clear packing tape together, having the sticky sides go together. Tape the base of these two straps to the center hole. Wrap the straps up and over the child's shoulders and back down to the center hole (like a backpack). You can use the clear packing tape to secure anything else when the costume is on too. For instance, I secured the horse head through the hole more with tape to keep it from moving or wobbling around. This princess on a Pegasus costume won first place for my daughter at a Halloween costume contest that year.